They’re not likely to make many more splashy moves, but there are still some areas where the Vikings could make revisions to their roster. The Vikings made blockbuster headlines during the first wave of free agency, signing Kirk Cousins to the first fully-guaranteed deal for a quarterback in the salary cap era and landing Sheldon Richardson on a one-year, $8 million deal. Minnesota also added some offensive line help by signing former Bears guard/tackle Tom Compton, and the Vikings still have $20.4 million in salary cap space left, according to NFLPA records. Offensive line depth: Adding Compton gives the Vikings another option for their right guard spot, and former Eagles guard Josh Andrews could compete for the job, too. But with Joe Berger heading into retirement and valuable utilityman Jeremiah Sirles signing with Carolina, the Vikings could stand to add another player to help on the line. GM Rick Spielman was at Ohio State’s pro day last week to take a look at Billy Price, who could be a target for the Vikings in the draft, but another veteran at the right price wouldn’t be a bad investment. 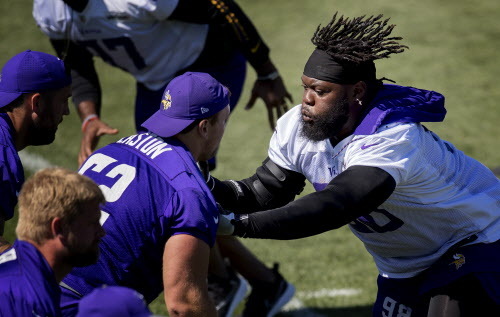 Defensive tackle depth: Richardson should be the Vikings’ new three-technique tackle, replacing the departed Tom Johnson and Sharrif Floyd (who still remains in settlement talks with the Vikings over the grievance he filed in September and who broke his months-long silence with a strongly-worded Instagram post over the weekend). Second-year man Jaleel Johnson figures to step into a bigger role in the defense in 2018, but with Shamar Stephen joining Tom Johnson in Seattle, the Vikings figure to need at least one more body to help in a rotation behind Richardson and Linval Joseph. Linebacker: Emmanuel Lamur, who left Minnesota to reunite with former Bengals defensive coordinator Paul Guenther in Oakland, leaves the Vikings with just five linebackers on the roster. Second-year man Eric Wilson could step into a bigger role this year, but it wouldn’t hurt the Vikings to look to add to the group in the draft — particularly if they can find either a big run stopper or a player that can function as a linebacker/safety hybrid. Wide receiver: The team’s decision to release Jarius Wright made sense from a salary cap perspective, but it also took away a reliable option from a team that has few proven players behind Stefon Diggs and Adam Thielen. There are a few in-house options here; the Vikings continue to hope Laquon Treadwell can break out in Year 3, Coley could get a chance to replace Wright in the slot and former CFL receiver Brandon Zylstra could be a training camp surprise. But a receiver that can stretch the field and compete for a returner job might make sense. Tight end: The Vikings tried to sign Jared Cook a year ago, and it makes sense for them to add another pass-catcher to complement Kyle Rudolph, especially given new offensive coordinator John DeFilippo’s affinity for throwing to tight ends. An athletic player at the position could be worth a look in the middle rounds of the draft.